Hallmark's Crown Royale has elite Fiber and Incredible Density. The son of Snowmass White Gold (Accoyo Legacy x Accoyo Dani), and his stellar dam, 5Peruvian Hallmark; Crown Royale's lineage is the epitome of North America's elite genetics. As a yearling, his prime blanket weighed in after skirting at 7 lbs. 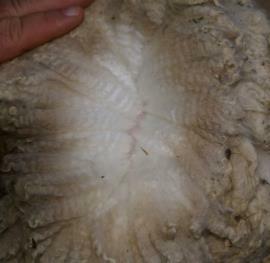 This fleece has won two color championships in the first two shows it was entered. Speaking with one of the judges she said this was the only fleece she had even given a perfect score of 20 points for fleece weight. Crown Royale's fiber is super fine with impressive staple length and very, very uniform. Deep crimp with luster galore, this macho has truly earned his herdsire status. Elite genetics from Victor and Hemingway have given us Sweet Pea, a high end production gal. Multiple blue ribbons from a championship blood line. 2017. Two champions should produce a fine cria! Neon Moon is an amazing offspring of Hallmark's Crown Royal. Crown Royale's elite quality and incredible fineness, brightness and density have earned this impressive herdsire three fleece championships and a perfect score of 20 points for density! He is the son of Snowmass White Gold (Accoyo Legacy x Accoyo Dani), and his stellar high selling dam, 5Peruvian Hallmark. Couple these genetics with her mother Sweet Pea's ancestors including Victor and Hemingway and you have a girl ready to produce fine fiber of show winning caliber. At one year old Neon displayed tons of brilliant crimpy silk all over and shared her incredibly delightful personality with all her human friends. 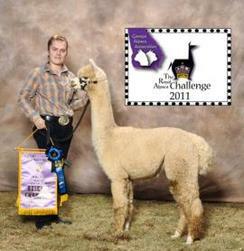 Neon won a reserve color championship in her FIRST show, The Royal Alpaca Challenge! At 4 yrs old she still had a very impressive histogram, 16.8 micron, SD 3.4, CV 19.9% and > 30% 0.6%! 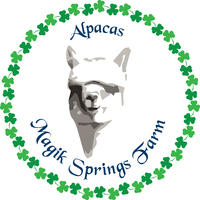 She has been bred to Snowmass line, a genetic match that should result in excellent cria. Having this award winning girl as part of your breeding program?